Saraf nodded his head up and down and bent over so Jamil could climb on his back. He thought about the dates and his tummy rumbled, reminding him how hungry he was. The camel nodded his head and snorted. He galloped through the sand without a care in the world. Saraf, being a stubborn camel, heard Jamil's threats. He stopped. What Jamil didn't realize was that Saraf understood everything he said and each time he threatened the camel, he heard. Saraf snorted and kicked the sand with his hooves. Jamil climbed off the camel's back. He walked around to Saraf's face and looked him in the eyes. “Saraf, I must get to the pyramids. Do you not want dates? 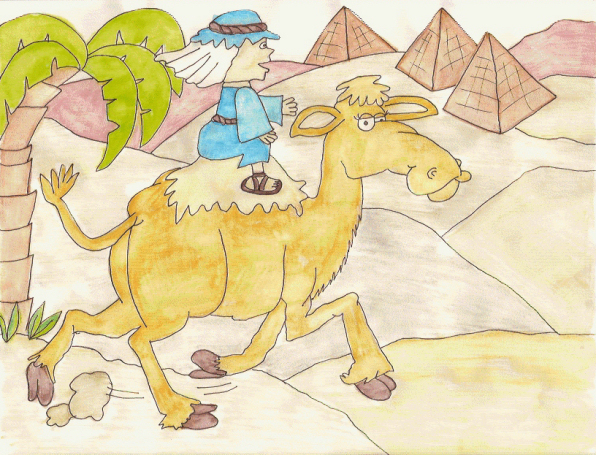 Do you want to be hungry?” Jamil climbed back on the camel's back. Saraf sat in the stand. He collapsed his legs and fell to the ground. “Oh no! Don't do this, Saraf! I must go. You are stubborn. Bad camel,” Jamil sighed. The camel's ears twitched and turned to look at the boy. Jamil climbed on Saraf's back. Saraf stood, shaking the rest of the sand off. He snorted and then ran toward the pyramid. He wanted some dates. Jamil looked over at Saraf and winked. “We encountered a sand storm. Saraf saved my life.” He stroked the camel's back. “In that case, Saraf will get two buckets of dates,” his father said. That night Saraf sat near the pyramid munching on his dates. Jamil walked past and patted him on the head. “You're a good camel, Saraf. I will never call you stubborn again.” And he didn't.